If you experience a collision and need auto body repair, it involves much more than just repairing and repainting dents and dings on your car's body. In many cases, the frame itself is damaged, and auto frame repair is necessary to restore the structural integrity of the car. 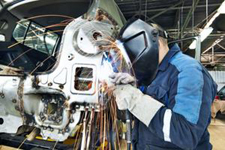 A good collision repair shop will give at least as much attention to restoring the frame as it will to restoring your vehicle's outward appearance. Why is frame repair so important? When your car was first built, the manufacturers designed it to account for aerodynamics, balance, alignment and overall safety. The frame is designed with “crumple zones” to give way in a controlled manner in the case of a collision, protecting the passengers as much as possible. If the frame of your car is dented or damaged in a collision, it can throw everything off kilter. Your vehicle's balance and alignment can be affected, making the car more prone to drift or causing unhealthy wear on the tires. Even more importantly, if the frame isn't restored to the manufacturer's precise specifications, it might not protect you if you're in another crash. Auto frame repair is a key to restoring not only the way the vehicle drives, but also the way it protects you. Not surprisingly, these days, auto frame repairs begin with a computer. Your auto body repair experts will use a computerized frame measuring system to determine the exact specifications needed to restore your vehicle frame to its original shape and integrity. At that point, precision equipment is used to straighten the frame back to its original shape and strength. When you drive the car home, it feels the same as it did before the collision, and more importantly, it offers the same degree of protection to you and your family if another collision occurs. Of course, auto body repair doesn't just restore the integrity of your car, but your car's appearance, as well. After precision part replacement, expert dent repair and computerized paint matching, your vehicle should leave the shop looking as good as it did before the accident (if not better). Even if you're a do-it-yourselfer, this job is too important to your safety to be attempted on your own. To ensure the job is done right, auto frame repair should only be done by a trained expert, preferably by a technician who is I-CAR certified. In Mansfield and north Texas, Auto Tech Services (ATS) Collision Repair Center offers a full array of repair services, from minor dent repair to full collision repairs to custom auto painting, with a 15-year record of customer satisfaction and an I-CAR Gold Class rating. To learn more about auto frame repair and obtain a free estimate, they can be reached at (817) 405-3444.